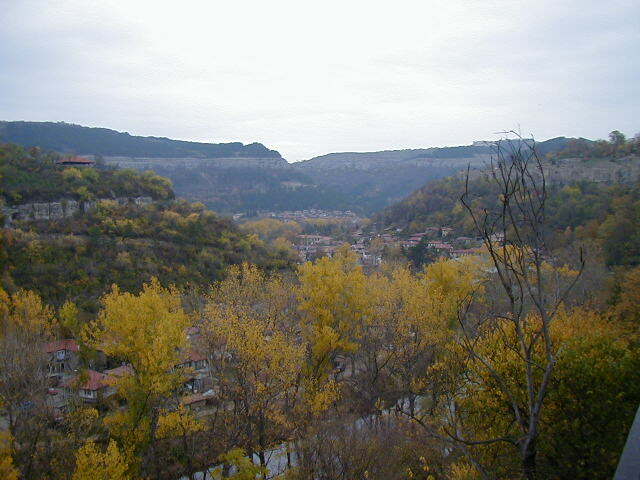 I left Sophia at 11:00 in the morning on 1 November and arrived in Veliko Tarnovo around 2:00 in the afternoon. Buses in Bulgaria are much faster than trains; the train that took me into Bulgaria took three times as long to cover the same distance. 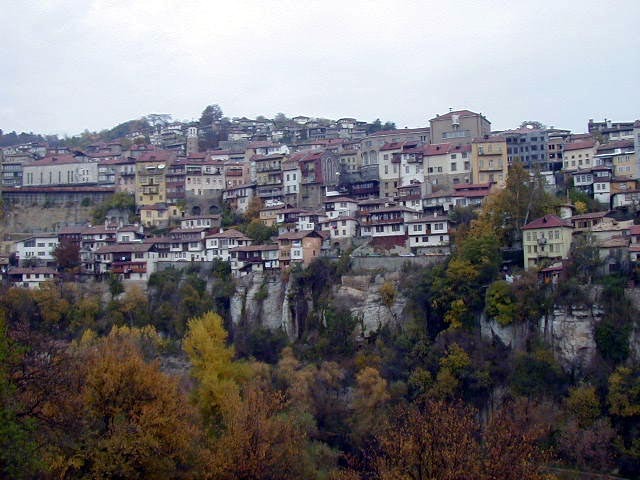 Veliko Tarnovo was the capital of the second Bulgarian kingdom. Now it is a very pretty university town in the center of the country. It is in a mountainous area and the buildings cling to steep hills around the Yantra river. It is rich in history, but many of the main sights were closed this late in the year. Also, my all encompassing Europe guide book had very little information. In spite of this, I liked the feel of the place. The beer was not as good as in the Czech Republic, but it was good enough and only fifty cents a half liter. Also, in Bulgaria you can get a good bottle of wine for about a dollar. I only stayed two days, but want to go back some day during the summer and have another look. 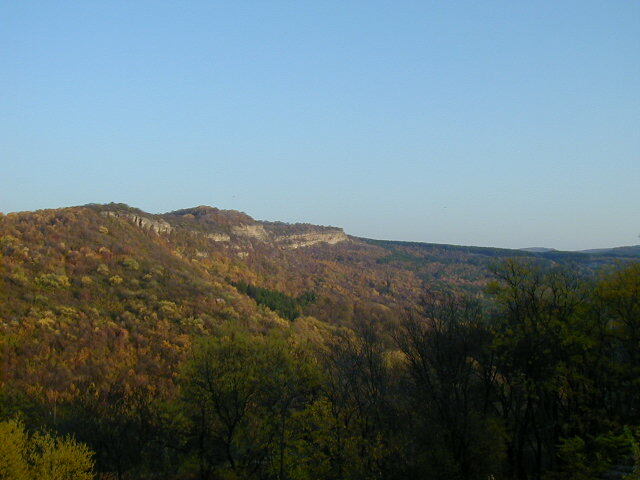 Visible from everywhere in Veliko Tarnovo is the Tsarevets fortress. 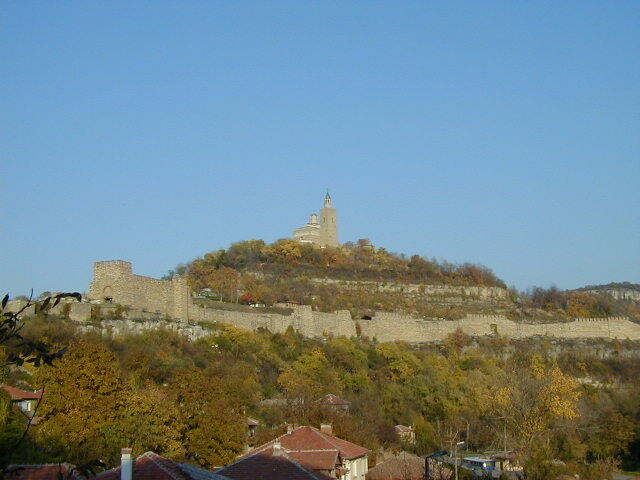 The Tsarevets fortress was originally built in the fifth century by the Byzantium empire. 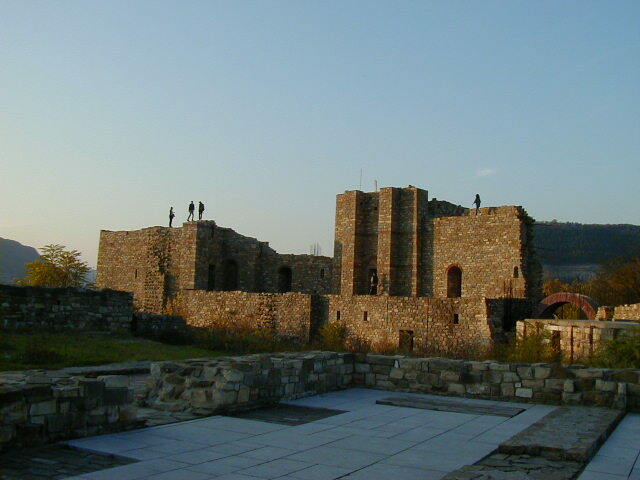 The Slavs captured the area in the seventh century and in 1185 the town was the center of the uprising that resulted in the second Bulgarian Empire. That's what my guidebook says. It doesn't say what the first Bulgarian Empire was. Maybe that was Thrace. 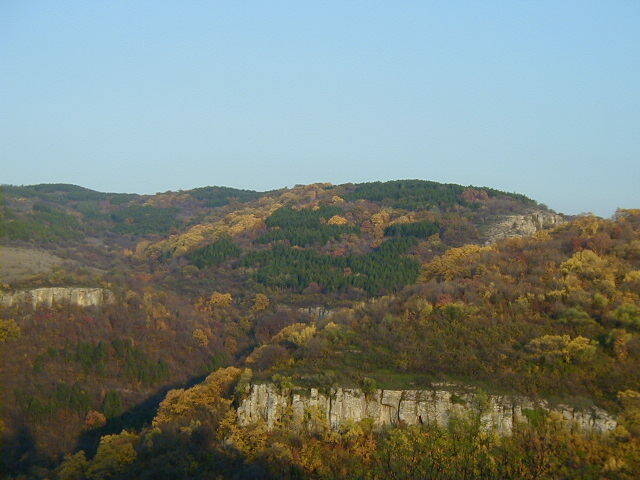 Anyway, the remains of the fortress still dominate the area. The road leading to the fortress was designed to be easily defended. 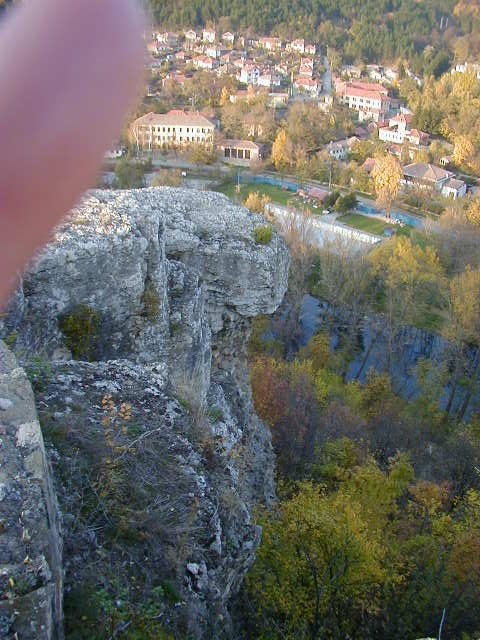 The last picture in the short sequence below is of Execution Rock. Traitors were thrown off this rock into the river below. The finger in the corner is there for stylistic effect. No really, it's no accident, it's artistic. 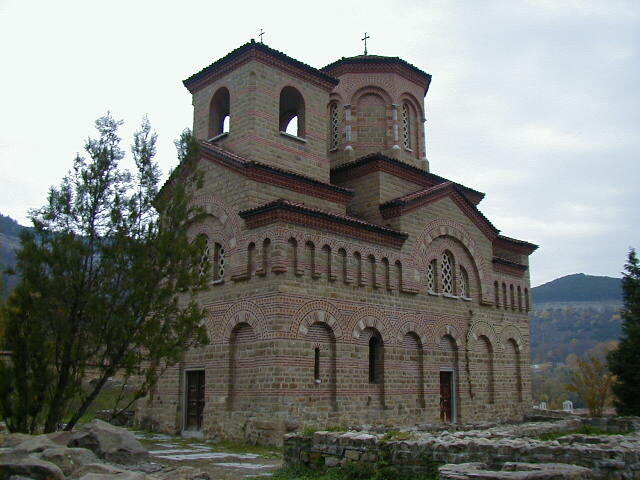 The next few pictures are of Veliko Tarnovo, some of the surrounding country, and the twelfth century Church of St Dimitar, where the rebellion that led to the Bulgarian Empire began. It was one of the important sights that was closed. 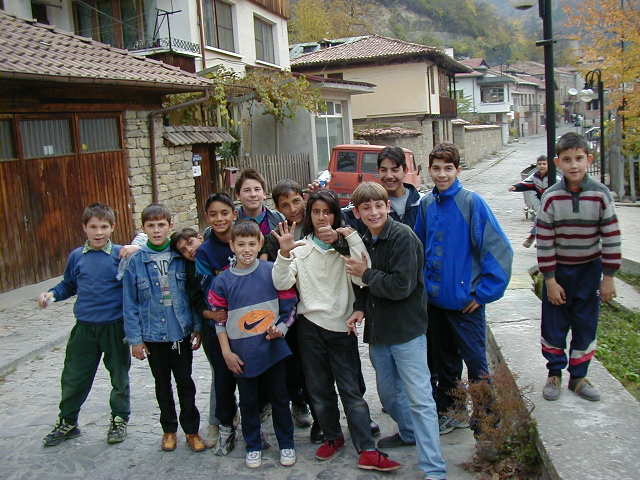 The last picture is of a group of kids who discovered I was from America and got all excited. I thought that was cool; it is hard to find a place where Americans are considered a welcome novelty. After leaving Veliko Tarnovo I found out they had a tourist information office, not mentioned in my guidebook, that would have steered me to other interesting sights. This office also could have arranged a homestay room for me that would have been much cheaper than Hotel Eger, which cost me $17 a night. I was bummed. 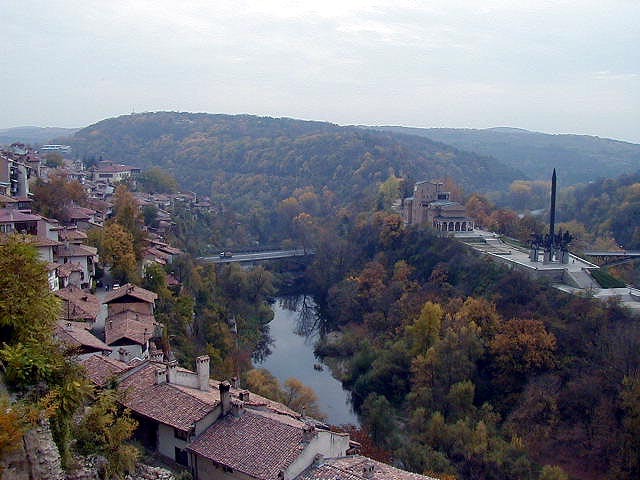 I liked Veliko Tarnovo and would have stayed longer if I'd had more information. It is not one of the "Must See" tourist stops, it is a mellow, pretty place few people visit, and it is cheap and a good place to relax. Many vacations focus too much on must see things and not enough on relaxing. Oh well, opportunities missed. From Veliko Tarnovo I moved on to Plovdiv.